As kids in the 1980s growing up in Kitchener, we would buy our music anywhere we could find it. A lot of mine came from the mall: stores like Zellers and A&A Records. Other places to find music included Hi-Way Market on Weber Street. That place was incredible. They had the largest toy section I’d ever seen, and every Christmas a professional Lego builder would put together a giant display. None of these places exist anymore. Another place that carried a small section of music was actually Dutch Boy Food Markets, just down the street from Hi-Way Market. It too is long gone, but I have many memories of that place. It had a small music section, but they also sold food, toys and clothing. It was considered a supermarket but it had a little bit of everything. My dad remembers buying many of my beloved G.I. Joe figures at that store. He also says that we bought our Atari 2600 there. That Atari still works today. I think we got it in 1982. My aunt actually used to work at a Dutch Boy location (not the same one) in Waterloo. My friend Bob used to go there frequently. I used to think it was because he was Dutch, but it probably had more to do with the fact that one of the Kitchener stores was within biking distance. One afternoon in early ’88, we hopped on our bikes and hit Dutch Boy to check out the music section. This “new” band called Whitesnake had been in our ears lately, but we only knew two albums: Slide It In and Whitesnake/1987. I didn’t even know they had any albums out before Slide It In at that point. 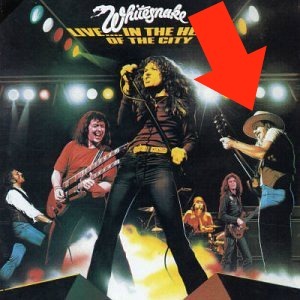 You can imagine our surprise when we found numerous other Whitesnake titles at Dutch Boy: Snakebite, Trouble, Lovehunter, Come An’ Get It, Saints & Sinners, and Live…in the Heart of the City. All reissued by Geffen, all on cassette. Each of us grabbed a mitt full of Whitesnake cassettes and began examining them for more details. This Whitesnake and our Whitesnake were both on Geffen. This Whitesnake shared the same logo that was found on Slide It In. It had to be the same band after all. I explained this to Bob. “Yeah,” he replied, “but have you ever seen that guy before?” He pointed to Mickey Moody on the cover of the live album. He sure didn’t look like anybody I knew from Whitesnake, but it was impossible to ignore the evidence. “I think,” concluded Bob, “that Whitesnake are another band that had albums out before we heard of them.” That happened from time to time. We would discover a “new” band like White Lion or Europe, only to find that they had some little-known earlier albums. It made it both frustrating and exciting to try and collect albums. We both started collecting the earlier Whitesnake music. Bob was first, picking up Saints & Sinners at Dutch Boy. He brought the tape over one afternoon for me to copy. We loved the original version of “Here I Go Again”, as well as “Crying in the Rain”. Later on, I added Snakebite and Come An’ Get It to my collection. I enjoyed the earlier, more rock & roll sounds of these previously unknown Whitesnake tapes. I’m not sure exactly when Dutch Boy closed, but I do remember the last album I bought there. It was now spring 1990, and I had a CD player by then. Once again Dutch Boy did not disappoint. I found a Van Halen disc there that I had never seen before on any format other than vinyl. The album was Fair Warning. Since it was the most “rare” Van Halen I had found so far, I chose to buy it. It came to about $24 with tax, a lot of money for an album that was barely half an hour long. It should go without saying that Fair Warning was one of the best purchases that my young self ever made. Too bad Dutch Boy had to shut its doors. It was a good store and I hear a lot of fond memories of it from others. Do you remember? It’s really funny how things are in differnt countries, For us Europeans, Whitesnake more or less stopped being Whitesnake with their 1987 album and their more mainstream pop-metal sound. To us, Whitesnake 1978 – 1984 are the real deal. I guess Coverdale was sick of not having big success in the States and decided to change direction. Big mistake, musically, in my opionion. I was a late Whitesnake “bloomer”, seen through European eyes, as I discovered them first 1984 with Slide It In. Of course, I knew ABOUT them, but they failed to make me intereseted and it would take the video for Gulity Of Love to get my attention. After that I was hooked. I also believe that changing the Whitesnake logo was almost as stupid as changing the musical direction and their look. That logo is probably the coolest band logo ever while their “new” one that appeared on the 1987 album is mainstream and dull. Don’t forget, Coverdale made two really good solo albums in 1977 – 1978, White Snake and Northwinds. If you haven’t already done so, you really need to check them out. Jon, I remember hearing about this new band WHitesnake…their song sounded good, Viv Campbell and Rudy Sarzo were in the band, so that was like a stamp of approval! We had no idea about anything prior to Slide It In. Those albums were deleted and their videos never got played over here. Then North America went wild discovering Whitesnake! And yes the best stuff is ALL before 1987, no question. I loved their old logo too. Ah well. The new/current one(s) are just “fonts”. Oh and yes I do own White Snake and Northwinds, both remastered! I remember Dutch Boy, and the commercials. They played on the local radio and I think CTV. It would be neat to hear one again. $24 in 1990. That’s righteous bucks. I remember it well! Had my first job there bagging ice when I was 13. My mother spent a large part of her career as their receptionist at head office in Waterloo. The Humphrey family owned and operated dutch boy to my recollection. Their son, Scott Humphrey (readers of Mike’s blog will recognize that producers name) used to work there I believe. His sister, who’s name escapes me, ran the flying dog/revolution back in the day (even back when it was called super skate seven) how’s that for a blast from the past!!! I think her name was Shelly. My wife and her sister knew the family. One time my girlfriend(now wife), myself and some friends were at The Twist(the name between Super Skate 7 and Flying Dog/Revolution), and some juice head football guys were pestering our girlfriends. My girlfriend told the bouncer she knew Shelly, and instantly those dudes were thrown out. It was awesome. Mike, you forgot to mention Dutch Girl!?!? I had no idea Dutch Boy sold music, but I have really vague memories of the store. I remember the Hi-Way Market better. My great-uncle worked in the camera department there. Great story Dude! I remember the excitement of seeking out tapes – it’s an excitement I still feel now. It’ll probably never go away. I have fond memories of both Dutch Boy and Hi Way Market. We did some serious toy shopping at both places.I hated Toys R Us when it first opened as it was so stark and boring in comparison. It was great shopping there as you never knew what you would find. Dutch Boy was regional, obviously. No Dutch Boy in Sudbury…though we did have A&A Records. I loved A&A. I should do a post about some highschool memories of that store.